Microsoft has released some new data figures related to their Xbox 360 console. As of this week, Xbox 360 sales have surpassed 76 million units. 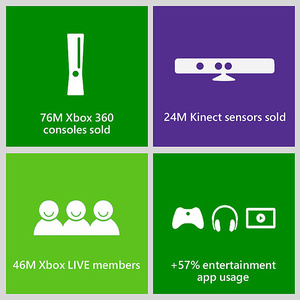 Kinect sales have now reached 24 million, as the motion controller remains popular. Additionally, the company says Xbox Live now has 46 million paying subscribers. The Xbox remains the most popular console in the U.S., outselling the PS3 and even the newer Wii U. Says the company: "2012 also marked the Xbox's biggest year for entertainment and games usage. Users enjoyed more than 18 billion hours of entertainment in 2012, with entertainment app usage growing 57 percent year over year globally. Last year in the United States, Xbox LIVE Gold members averaged 87 hours per month on Xbox, an increase of 10 percent year over year."